The folks at Rocketbook make an awesome product. Jot down your thoughts, snap a photo with the app, and upload it to the cloud service or email of your choice. Wipe your notebook clean, and do it all over again. They’ve teamed up with the folks at Think Board to combine Rocketbook’s magic with Think Board’s peel and stick whiteboards to create the Think Board X, so even your murderboard can be properly immortalized in the cloud. Think Board is basically a whiteboard you can slap up anywhere. They make boards you can stick to desks, or walls, or fridges, or I guess your car if you change your advertising often and don’t drive where it rains. The point is, you don’t need to worry about drilling holes in your wall, or having your magnetic whiteboard slide halfway down your fridge. This is a pretty smart bit of synergy with Rocketbook, especially since Rocketbook recently added optical character recognition (OCR); you can slap up a Think Board, scan it using Rocketbook’s app, and your notes are not only saved but searchable. ThinkBoards will come with the same scanner codes at the bottom as Rocketbooks do, so if you already use Rocketbook your settings will be the same. 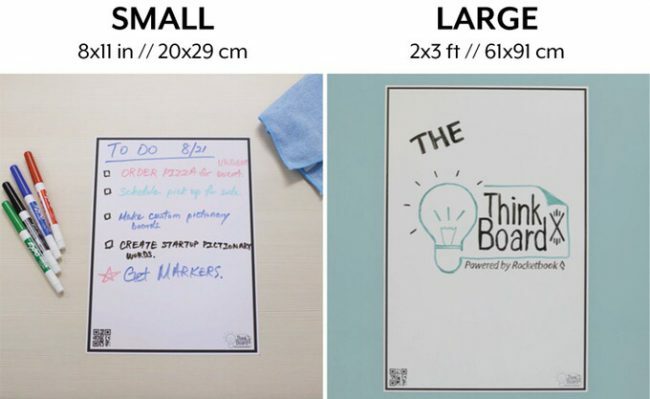 Rocketbook and Think Board are using Kickstarter to raise $21,500 to make their scan-able peel and stick whiteboard dreams come true, so check them out today! We’ll be getting our hands on a prototype soon as well, so keep an eye out for the review.